Modified reports and exports to show names as first name first rather than last name first. Corrected some window sizing issues. Corrected an error when exporting in text format. Modified text format export to optionally include shoot name, range, date and agg/combo agg titles. Removed equipment list options since they weren’t working correctly…may reinstate later when problems are corrected. Created new setup to install correctly on newer operating systems as well as fix report problems. Added Cash Option, Teams and Cash Option Small Groups. Also corrected problem where you could not blank out a score on the scoring grid. Corrected problem in new scoring window where pressing the enter key after entering a group would not correctly update the agg. Arrow keys were working fine, but enter key was not. Corrected problem where, during shoot creation, selecting a range with a zero bench count would prevent the shoot from being saved. Also added a check for valid values in the First Bench and Last Bench fields. Automatic bench assignment now allows specifying starting and ending benches for shoots where match directors opt to only use some of the available benches. Replaced old scoring window with completely new version. The new scoring window works like a spreadsheet allowing entry of groups directly in the grid. Old code that automatically found the next group to be scored was eliminated. These changes were implemented to make it easier to find and correct data entry errors. This will also correct a sporadic problem where entry of a group value would sometimes propagate to multiple shooters and require considerable time to find and correct. Previously use of the decimal was required when entering groups. Groups may now be entered either with or without decimals. If you do not use a decimal, Bughole assumes three decimal places, so you must enter trailing zeros if the group size ends with a zero. Report modifications. Agg Reports moved Agg column to left next to shooter names to make reading agg easier. Combination Agg reports moved Grand Agg column to left next to shooter names to make reading grand agg easier. Increased font size on all agg and combination agg reports. Minor maintenance issues. Version not published. Added Cash Option. A new Games menu item has been added to the main window menu bar. The Games menu contains (for now) only one item…Cash Option. Clicking Cash Option will display the Cash Option Shooters window. To enable Cash Option just add all cash option shooters using this window. The Agg report and Combination Agg by Rank report now indicate cash option shooters with a $ in the leftmost column of the report. The Agg report now includes a subreport (immediately underneath the Small Group winner) which lists the cash option small group winners for all matches. This new subreport will only appear if cash option shooters have been added to the list. Bughole 1.1.5 will automatically upgrade any Bughole database from version 1.1 or higher. Version 1.1.5 requires running the full setup so the option to download only Bughole.exe has been removed from the website. Version 1.1.3 users who did not download the database that was pre-populated with shooter names will not be able to run Combination Agg reports. This was caused by a missing field in the CombinationAggReport table in the empty database. Version 1.1.4 corrects this problem by automatically adding the field if it is missing. If you already have version 1.1.3, you can get the update by downloading only the updated exe from the link above. After download you will need to unzip the file and copy it to your Bughole installation folder (normally C:\Program Files\Bughole), overwriting the existing Bughole.exe. IMPORTANT! Starting with version 1.1.3, Bughole is no longer supported on Windows versions earlier than Windows XP. It also requires a minimum of 256 megabytes of ram. Don't try to run Bughole on a 10 year old computer running Windows 98 or Windows 2000! I just don't have time to deal with the problems . IMPORTANT! Bughole database format has changed and Bughole 1.1.3 will not automatically upgrade a Bughole 1.0 database. There are a few folks with early copies of Bughole 1.1. Bughole 1.1.3 will automatically upgrade those databases. Bughole Setup will attempt to detect an existing Bughole installation. If an installation of Bughole 1.0 is detected, the installation folder of that older version will be renamed to Bughole_OLDVERSION before Bughole Setup installs version 1.1.3. If the existing installation is version 1.1.0001 or higher it will be upgraded in place. Your old shoot data will still be accessible by running the old version of Bughole directly from the Bughole_OLDVERSION folder (normally found under the Program Files folder). There is no way to convert Bughole 1.0 shoot data to Bughole 1.1 format. Shoot data may now be exported and imported. The file extension for Bughole shoot data is “.bhl”. The old way of exporting shoot data to text files is still available, but the “Bughole Format” is now the default. Note that internally bhl files look sort of like XML, but they are not XML files (this is for you programmer types who might be tempted to import the files into an XML editor). Report fonts have been changed and reports modified to fit more data on each page. The selected font, Estrangelo Edessa, is a standard font in Windows XP and Windows Vista. It is not shipped with Windows 2000 or Windows 98. Ties are indicated by the letter T in the far right column along with a number indicating the results of the tie breaker calculation, for example if three shooters tie, the winner will be indicated by T1, second by T2 and third by T3. Ties for small group are determined by the shooter with the smallest agg, and the correct small group tie winner will be shown at the bottom of the agg report. A new Flag Sharing window has been added to make assignment of shooters to flag sharing groups easier and less prone to error. The Flag Sharing Signup list report now prints the shooters signed up for flag sharing. Previously it printed only a blank form for shooters to sign up. Earlier versions of Bughole had a bug in the shooter pick list that would prevent some names from being visible when using progressive search. For example, in the shooter pick list you could type in the last name “Smith” and Howard Smith would not be in the list of displayed shooters. This bug has been fixed. Alignment errors on the Mailing Label and Target Label reports have been corrected. A new report has been added, Combination Agg By Competitor Number. Thanks to Wilbur Harris at Benchrest Central for providing this website. 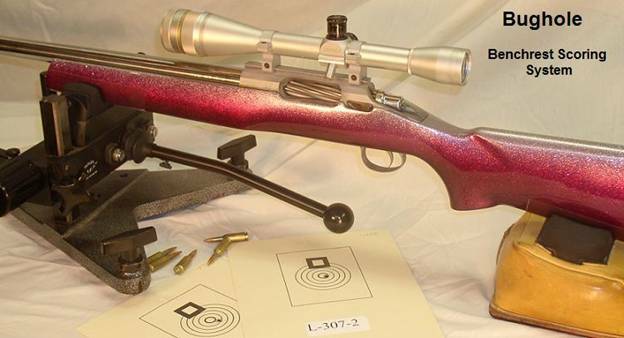 If you need to contact me my email address is listed on my Benchrest Central profile page. Please include a subject line starting with the word Bughole. If you do not include a subject line that I can recognize as non-spam, you will probably wind up on my email blacklist. If you would like a copy of the database pre-populated with shooter data, please send me an email.